Throughout the inner solar system in 2016, NASA, ESA, JAXA, Roscosmos, and ISRO built upon their prior year successes and demonstrated a coordinated and cooperative approach toward advancing scientific returns from around Earth’s immediate neighbors. For these agencies, non-Earth orbital exploration yielded surprising and dramatic changes to our views of the Sun, Venus, the Moon, and Mars via arrivals, discoveries, and cooperative investigations. The oft forgotten but wholly important element of our solar system has the largest number of operational spacecraft and instruments dedicated to its round-the-clock study, including the Solar Dynamics Observatory (SDO), DSCOVR, PICARD, the Solar Monitoring Observatory, the Solar Terrestrial Relations Observatory, Hinode, the Reuven Ramaty High Energy Solar Spectroscopic Imager, the Advanced Composition Explorer, the Solar and Heliospheric Observatory (SOHO), and the Global Geospace Geoscience WIND. In a relatively quiet solar year, one that satellites and instruments again spent continuously peering at the sun, the year afforded an opportunity for space-based craft to observe and study the transit of Mercury and potentially unlock a solar question that has puzzled scientists for decades. Occurring roughly 13 times each century, the transit of Mercury is far more common though less celebrated than the transit of Venus. 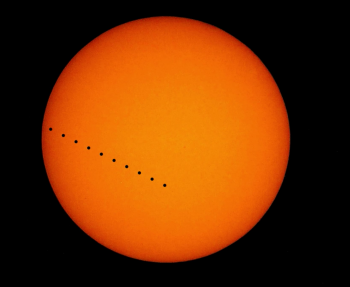 Regardless, Mercury’s transit of the sun is equally valuable in terms of stellar observation. Historically, the transits of Mercury were used to measure the apparent size of Mercury and help estimate the distance from Earth to the sun. This year, the transit of Mercury occurred on 19 May and was observed cooperatively by SDO, Hinode (a JAXA led and NASA, ESA, and UK supported mission), and SOHO (a joint operation of NASA and ESA) – for which two of SOHO’s dormant instruments were turned back on: the Extreme Ultraviolet Imaging Telescope and the Michelson Doppler Imager. 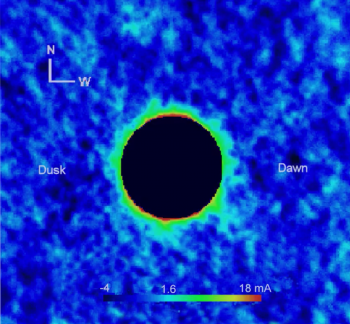 During the transit event, SOHO measured the sun’s rotation axis – part of a long line of observations which help scientists better understand how the sun changes over hours, days, years and decades. Likewise, SDO used the transit to help with instrument alignment, made possible because scientists know with such precision where Mercury should be in relationship to the sun that they can use it as a marker to fine tune exactly how SDO’s instruments should be pointed. For SDO, the Mercury transit observation campaign was not the only significant return this year, with the craft also providing a new understanding of solar waves and, in connection, a revelation about a long-standing mystery of the sun’s coronal temperature. For the solar waves, the sun is constantly changing as charged material courses through not only the star itself, but throughout its expansive atmosphere. Understanding the path this charged material (the solar wave) takes through the sun’s multiple layers, how it heats up the sun’s atmosphere, how it creates a steady flow of solar wind streaming outward in all directions, and how magnetic fields create regions that can explode in giant eruptions is a key element to SDO’s mission. In a scientific paper announced in October, scientists revealed that SDO, along with the Interface Region Imaging Spectrograph and Big Bear Solar Observatory, had tracked a particular kind of solar wave as it swept upward from the sun’s surface through its atmosphere. Scientists have long suspected that the solar waves seen on the sun’s surface, the photosphere, are linked to those seen in the lowest reaches of the sun’s atmosphere, the chromosphere. But never before had scientist been able to track a wave up through the various layers into the sun’s atmosphere. “This research gives us a new viewpoint to look at waves that can contribute to the energy of the [sun’s] atmosphere,” said Junwei Zhao, a solar scientist at Stanford University. The implications of this study are twofold. First, the technique for watching solar waves gives scientists a new tool to understand the sun’s lower atmosphere, and second, it provides an avenue to potentially answer a long-standing question in solar physics: the coronal heating problem. For the first implication, “Watching waves move upwards tells us a lot about the properties of the atmosphere above sunspots – like temperature, pressure, and density,” said Ruizhu Chen, a graduate student scientist at Stanford. “More importantly, we can figure out the magnetic field strength and direction” because the effect of the magnetic field on these waves is so pronounced that instead of traveling straight upwards through the sun, the waves veer off and take a curved path through the atmosphere. “The magnetic field [acts] like railroad tracks, guiding the waves as they move up through the atmosphere,” said Dean Pesnell, SDO project scientist at NASA’s Goddard Space Flight Center. 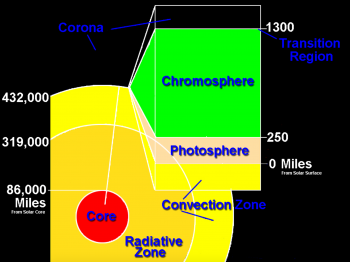 For the second implication, the coronal heating problem, models have always suggested that each layer of the sun should be cooler the further out they are. But the corona is roughly one hundred times hotter than the region directly below it – counter to what the models suggest. Presently, no one has been able to pinpoint the source of the extra heat in the corona, but solar waves may play a small role. “When a wave travels upwards, a number of different things can happen,” said Zhao. “Some may reflect back downwards or contribute to heating – but by how much, we don’t yet know”. The only spacecraft at Venus, JAXA’s Akatsuki vehicle marked the completion of its first Earth-year at Venus this month on 7 December. Last December, the mission settled into its preliminary orbit, but because of a five-year delayed insertion, recovery efforts, and investigation findings, JAXA controllers were forced to insert Akatsuki into a highly elliptical 440,000 km (270,000 mi) x 400 km (250 mi) 13 day 14 hour orbit of Venus. 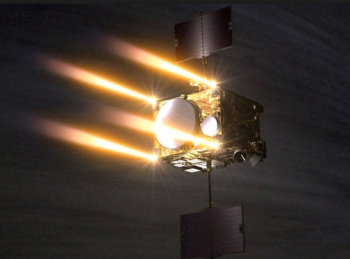 Following initial confirmation of Akatsuki’s health and orbital parameters, JAXA controllers fired Akatsuki’s thrusters on 26 March to lower the probe’s apoapsis to 330,000 km (210,000 mi). 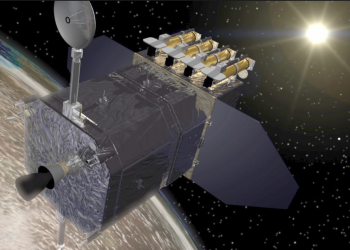 Lowering of the apoapsis resulted in a 9 day, stable orbit, well off the pre-mission planned 30 hour orbit that would have resulted had orbit insertion occurred as planned in 2010. Throughout the preliminary orbit and first month of the refined orbit, Akatsuki’s controllers powered up the craft’s onboard observation instruments. In early April, JAXA confirmed that all of Akatsuki’s instruments were functioning properly and had already conducted enough observations to meet minimum mission success criteria – which included capturing Venus’ all-globe cloud structure via continuous imaging from Venusian orbit. Following final checkout of its instruments, Akatsuki was taken to full operational mode and began its two Earth-year primary science mission on 28 April 2016. With Venus’ orbital period of 225 Earth-days, Akatsuki marked its first full Venusian year on 19 July, at which point JAXA confirmed that the spacecraft was operating well and was gathering information as intended to study the stratification of Venus’ atmosphere and the complex meteorology of the planet. Churning away in lunar orbit for its seventh year, NASA’s Lunar Reconnaissance Orbiter (LRO) continued to reveal more secrets of our closest celestial neighbor. In March, NASA announced that new information from LRO revealed that the spin axis of the Moon shifted by five degrees roughly 3 billion years ago. 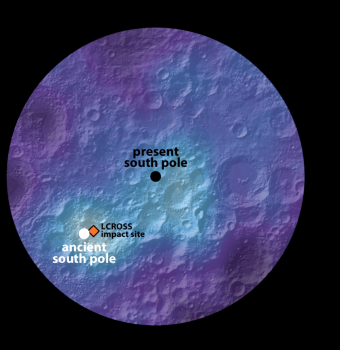 The discovery was made via LRO’s observation of the lunar ice trapped in craters at the Moon’s poles. When the spin axis of the moon shifted, it allowed sunlight to reach areas that were previously in constant shadow – evaporating ice present at those locations. Researchers have now discovered that the ice that survived this axis shift “paints” a path along which the axis moved. The researchers matched this ice path with models predicting where ice could remain stable and inferred the moon’s axis had moved by approximately five degrees. This is the first physical evidence that the Moon underwent such a dramatic change in orientation and implies that much of the lunar polar ice is billions of years old. While the primary data came from LRO and its instruments, corroborating evidence of the spin axis shift came from previously gathered data of the Gravity Recovery And Interior Laboratory (GRAIL) and the Lunar Crater and Observation Sensing Satellite (LCROSS) missions. Additional confirmation came from present-day observations of lunar ice concentrations that are displaced from each pole by the same distance but exactly opposite directions. 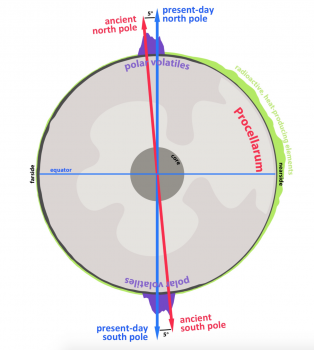 While a celestial body’s spin axis can change for a number of reasons, the change to the Moon’s is likely the result of a large change in mass in the interior Procellarum region on the lunar near-side. Concentrations of radioactive material in the Procellarum region were found to be sufficient enough to have heated a portion of the lunar mantle, causing a density change significant enough to reorient the Moon. Following this announcement, NASA revealed findings from LRO related to how the Moon received its 100+ distinctive “tattoos” – swirling patterns of lightly colored regions found across the lunar surface. Previous observations held two significant clues about their formation – 1. 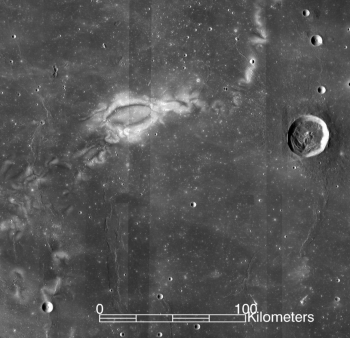 They occur where ancient bits of magnetic field are embedded in the lunar crust, and 2., the bright areas in the swirls appear to be less weathered than their surroundings. 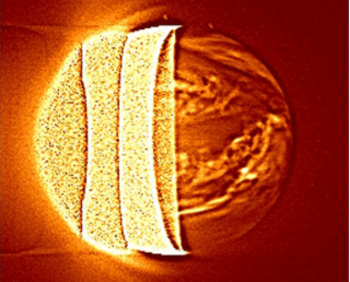 Those observations led to three prominent theories about how the swirls formed, one of which being that particles in the solar wind, being electrically charged, respond to magnetic forces around the Moon and formed shields – the lighter colored “tattoo” areas – on the surface that prevent surface weathering by the solar wind. This magnetic shield theory was tested with new observations by LRO and revealed that the lunar magnetic field can create a strong enough electric field – when the solar wind flows through it – to deflect and slow particles in the solar wind and therefore reduce the weathering from the solar wind, leaving brighter regions over protected areas. Moreover, in October, NASA announced a drastic alteration to scientists’ understanding of the age of the lunar surface. 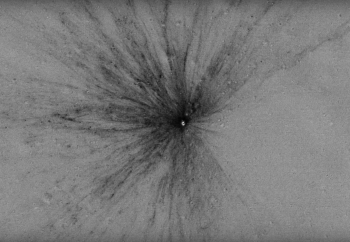 An analysis of LRO data led researchers to understand that the lunar surface experiences a heavier bombardment by small meteoroids than models had previously predicted. By comparing early mission and more current high resolution images from LRO, researchers were able to directly measure the rate of heavier bombardment as well as the rate at which the lunar regolith (top 1 inch of surface material) was overturned from micrometeorite impacts. Prior to LRO, scientists had estimated that it took 8.1 million years for 99% of the Moon’s surface to be overturned – made new. The new LRO data adjusts that estimate to just 81,000 years – 100 times faster than previously thought. Most of the major coverage and attention on Mars this year focused on the Trace Gas Orbiter (TGO – from ESA and Roscosmos) and Schiaparelli (ESA) lander missions’ launch and arrival at the red planet. While Schiaparelli was not successful in its attempt to land, TGO was successful in inserting itself into Martian orbit – all while Mars Express and the Mars Reconnaissance Orbiter (MRO) provided telecommunication relay and real-time monitoring of Schiaparelli’s and TGO’s approach and arrival sequences. 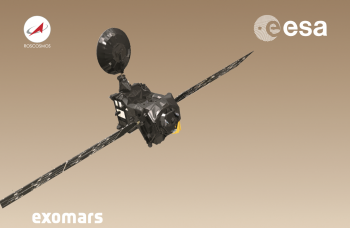 As with Mars Express and MRO, one of TGO’s functions is to increase and enhance the telecommunications network present at Mars ahead of the arrival of future spacecraft – notably the ExoMars 2020 mission by ESA and Roscosmos. With its successful arrival, TGO joined the five already operational Mars orbiters that continued to churn away in orbit and unlock Mars’ mysteries and perform technology demonstration for future Mars missions. In the realm of technology demonstration, the Indian Space Research Organisation’s (ISRO’s) Mars Orbiter Mission (MOM) saw the release of its first scientific results this year. The results, published in the journal Geophysical Research Letters, related to the Mars Exospheric Neutral Composition Analyser (MENCA) – which, while not making a discovery on its own, did corroborate MRO’s detection of briny water solutions on the Martian surface. While simply confirming another spacecraft’s discovery might not seem like a banner achievement, it certainly is for MOM, whose primary purpose is to serve as a technology demonstration for ISRO’s goal of placing a more robust scientific investigation orbiter around Mars in the coming years. The corroboration from MENCA also validated returns from ISRO’s Chandrayaan-1 mission to the Moon, which carried the CHACE (Chandra’s Altitudinal Composition Explorer) instrument that first detected ice on the surface of the Moon but whose results were preliminarily dismissed due to the unproven nature of the CHACE instrument. For ESA, 2016 marked the 13th year of operations for Mars Express and the continued return of information regarding Mars’ geologic past. This year, ESA released information from Mars Express regarding an ancient flood on Mars (evidence for which can be seen from orbit in the form of dendritic drainage patterns and formerly muddy sediments that have since dried and partially collapsed), observations of ancient tectonic stress and fault fractures, and evidence for ancient glaciers. 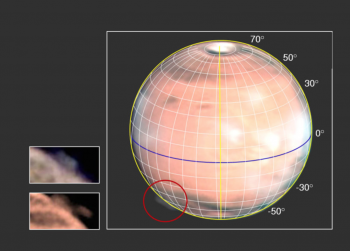 However, the coup de grace for Mars Express this year came in May via a series of observations from the craft in 2012 that have potentially shed new light on mysterious high-rise clouds observed periodically on Mars. The cloud-like plumes are seen at an altitude of ~250 km (~155 mi). However, none of the recorded plumes have been observed in situ by Mars orbiters – only from Earth ground- and space-based telescopes. 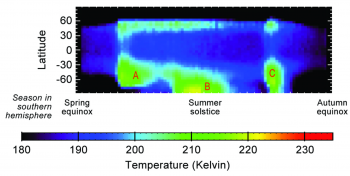 The extreme altitude/elevation of the clouds in the Martian ionosphere is unusual. Typical clouds consisting of frozen carbon dioxide and water are not able to form that high in Mars’ atmosphere. Nonetheless, the ionosphere is where the Martian atmosphere directly interacts with the solar wind, and this led scientists to look at plasma and solar wind measurements collected by Mars Express at the time of the most recent high-rise cloud in 2012.
Review of this data showed that a massive Coronal Mass Ejection (CME) from the Sun struck the Martian atmosphere at the same place and at relatively the same time as the 2012 cloud’s appearance. “Our plasma observations tell us there was a space weather event large enough to impact Mars and increase the escape of plasma from the planet’s atmosphere,” says David Andrews of the Swedish Institute of Space Physics. However, information from Mars Express did not conclusively prove that the CME event was the cause of the mysterious cloud. Corroborating evidence for a CME cause does exist, however, via the 1997 high-rise cloud observed by the Hubble Space Telescope at the same time that a well-studied CME hit both Earth and Mars. However, like the 2012 event, no spacecraft at Mars in 1997 observed that cloud, nor did they carry instruments sufficient to judge the CME’s impact on Mars. This, coupled with the fact that CMEs hit Mars many times without the appearance of these mysterious high-rise clouds creates a case for scientific doubt as to the relationship of the two events. Presently, Mars Express’ study of the Martian atmosphere will continue for several more years as the mission has been formally extended through at least the end of 2018 with enough fuel to remain operational until 2026. If Mars Express remains operational until 2026, it will enjoy roughly one year as the reigning longest-operational craft at Mars – taking the title from NASA’s Mars Odyssey orbiter which arrived two years before Mars Express but only has enough fuel to last until 2025. 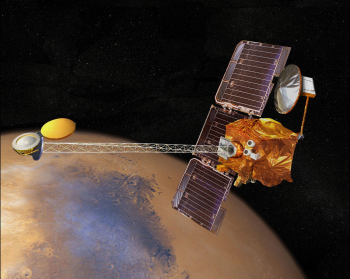 Mars Odyssey and its teams celebrated the 15th anniversary of the craft’s launch on 7 April and the 15th anniversary of its arrival at Mars on 24 October. With this longevity, Mars Odyssey has observed Mars through seven complete solar orbits and full seasonal variations – which has allowed scientists to begin constructing normal and varying climate maps and models of Mars through its four seasons. 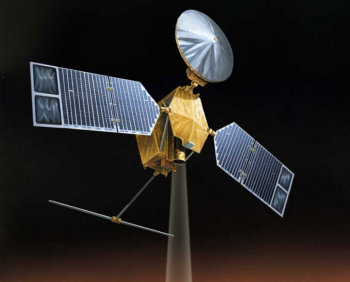 Mars Odyssey is currently in an orbit that not only permits it to pass directly overhead of the Curiosity rover twice daily for communication relay with Earth but to also observe the Martian surface during sunrise hours to collect data on morning clouds and fog. 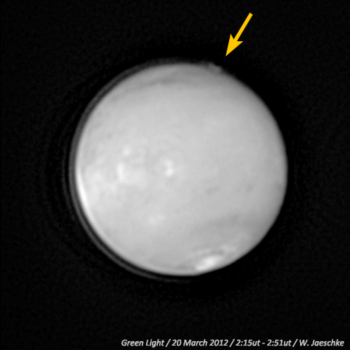 Moreover, observations of the briny water flows on Mars by Mars Odyssey’s THEMIS instrument allowed scientists to determine an upper limit on the amount of water contained at these deposits, which were discovered by MRO and announced last year. Data from Mars Odyssey indicates that the briny areas contain 30 grams of water per kilogram of soil, or about as much water contained in the driest sands on Earth. Importantly, this discovery does not contradict what scientists announced last year in the discovery of the salt water flows but rather lends a greater understanding to their composition and our growing knowledge of the nature of present-day water on Mars. For MRO, which marked its 10th anniversary at the red planet this year, water was once again a prime focus for the orbiter in 2016. Throughout the year, scientists announced numerous discoveries from MRO’s continuous observations of Mars – including the interaction of frosty cold nights and their effect on seasonal dust storms, the preliminary age of several ancient Mars lakes, and the discovery of a massive amount of water-ice locked under the surface of Utopia Planitia (roughly 12,100 cubic km (2,903 cubic mi) – or roughly the same volume as there is water in Lake Superior). 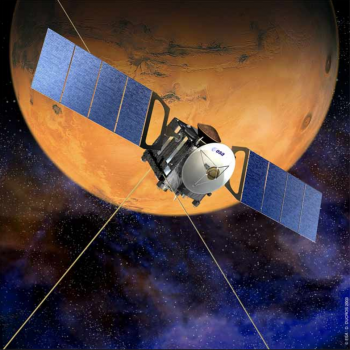 In the non-water arena, MRO’s biggest reveal this year came in conjunction with observations from a spacecraft that ceased operations in 2006 – the same year MRO arrived at Mars. Together with data from the Mars Global Surveyor, scientists have created a better understanding of the relationship between atmospheric temperatures and Martian dust storm events. By monitoring global and regional temperatures constantly from 1997 (when Mars Global Surveyor began operations) to present, a pattern between temperature and three types of large regional dust storms that occur in sequence at about the same time each year during the southern hemisphere spring and summer have emerged. “When we look at the temperature structure instead of the visible dust, we finally see some regularity in the large dust storms,” said David Kass of NASA’s Jet Propulsion Laboratory. According to the new research, dust lofted by Martian winds links directly to atmospheric temperature. In short, dust lofted into the atmosphere absorbs sunlight, and the sun heats dusty air more rapidly than it does clear air. In some cases, the heating difference between dusty air and clean air was discovered to be more than 35° C (63° F) – thus affecting global wind distribution. This new research may help scientists and mission planners drastically improve their ability to predict large-scale, potentially hazardous dust storms and provide safety benefits for robotic and human missions to Mars’ surface while at the same time increasing our understanding of how regional Martian weather events interact with and affect the global Martian atmosphere and climate. While observation of the Martian atmosphere is done by all orbiters, it is the primary purpose of the MAVEN mission. This year, aside from marking the completion of its second Earth year and first Martian year at the Red Planet, MAVEN returned critical information on Mars’ magnetic field, its gravity field, and the escape of water from Mars into space. 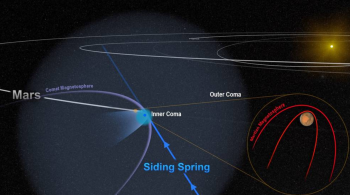 The most groundbreaking of these scientific returns, however, came from observations of Mars’ magnetic field as it interacted with the historic but not at all planned for close encounter with comet Siding Spring in October 2014. 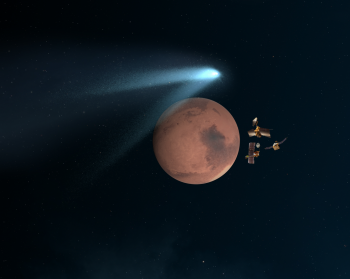 MAVEN had only just arrived in orbit four weeks before the comet’s pass and was placed into a protective orbit on the far side of Mars as the planet passed through Siding Spring’s ejecta tail. Moreover, most of MAVEN’s instruments were turned off during the approach. But the magnetometer remained on, and its measurements from the event reveal the chaos Siding Spring induced to Mars’ magnetic field. While Siding Spring’s nucleus was small (one-half of a kilometer – one-third of a mile), its coma was expansive, stretching one million km (~621,371 mi) in every direction. 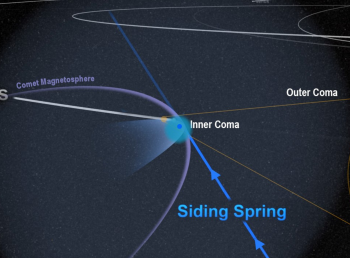 When Siding Spring passed Mars, the two came within about 140,000 km (87,000 mi) of each other, and the comet’s coma washed over the planet for several hours – with the dense inner coma reaching, or nearly reaching, the surface. Thus, Mars was flooded with an invisible surge of charged particles from the coma, and the powerful magnetic field around the comet temporarily merged with – and overwhelmed – Mars’ own weak magnetic field. At first, the changes were subtle as Mars’ magnetosphere started to react to the comet’s approach, with some regions realigning to point in different directions. With the comet’s advance, these effects built in intensity and almost made the planet’s magnetic field “flap like a curtain in the wind,” according to NASA. 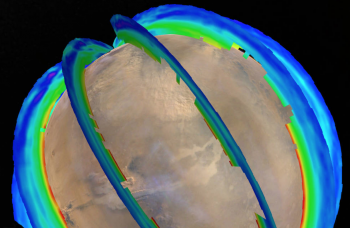 By the time of closest approach, Mars’ magnetic field was in complete chaos. Even hours after the comet’s departure, disruptions in the magnetic field were measured by MAVEN. In this way, the plasma surge induced by Siding Spring is similar to those of a strong but short-lived solar storm, understood to be a prime factor in the gradual but constant stripping of Mars’ atmosphere away from the planet and out into space. Like a solar storm, Siding Spring’s close passage is believed to have fueled a temporary surge in the amount of gas escaping Mars’ upper atmosphere – in essence providing a rapid view of the long-standing process MAVEN was built to study in the first place. 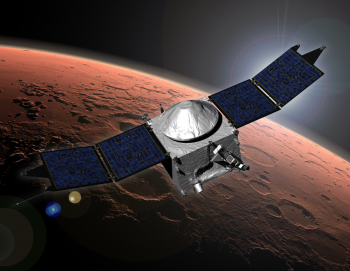 Presently, MAVEN’s science mission is slated to last until 2018, at which point the craft will transition to a primary role in the telecommunications network at Mars through 2024.